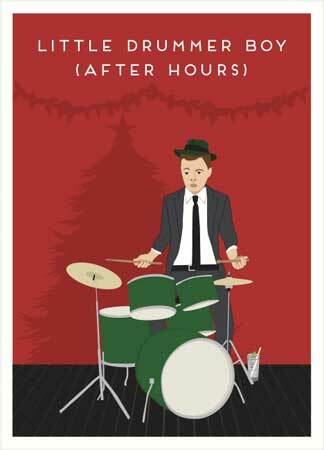 Little Drummer Boy After Hours Holiday Card – Check Santa’s naughty list first. If they clear it, tell that special person in your life to have a “Cool Yuletide” with this unique greeting card! Featuring a contemporary mod-inspired version of everyone’s favorite holiday drummer, the interior of the card says: Have a Hip and Happening Holiday. A special Christmas card that will truly bring a little joy to all your friends and family this holiday season. Each card comes with a matching envelope, both are crafted from recycled paper in the USA and printed in Canada with veggie-based inks. Card size: 7″ x 4.75″.